I've been waiting to write this post for over a year now - since 13 October, 2005, to be exact. He arrived yesterday afternoon. It's been a year of hand-wringing. Worrying. False alarms (those darn doorbells and 3 a.m. phone calls). Taps. Lonely parenting. It's been difficult. No, this year did not "fly by." But we made it. We're enjoying this time together as a family. E. is thrilled and giddy. So am I. ...and, no, I'm not going to quit blogging. I'm sure there's still lots to share. And there are more dimensions to me than this deployment (*eta: although it did define this blog - and now J. wants to know what I'm going to name it - "the Longest Year and a Half? haha" Funny, J.). So, what's next? Well, the venting and sharing (J. 's stories started today at lunch. They're pretty scary). And we will be working on getting out of the Army. That, in itself, should be an adventure! I just stumbled across your site and couldn't read this without commenting since I was going through this exact same experience at the exact same time. I am sitting here crying while my husband and sweet little girl (who was born 06/06 while he was over there) are sleeping. So many emotions that I have happily not had to feel in a long while came rushing back. 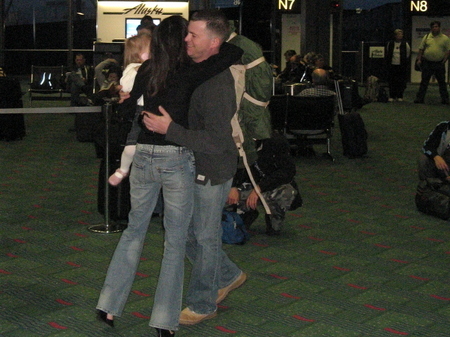 I am so glad you have him home, and can't wait to read more about your return to life as a complete family! I found your page when looking for patterns for aprons, but got so much more. Hope I'm not a "lurker" but after reading your info my heart goes out to you and your family. I have several friends who currently have sons in Irag. Happy to here your family is back together. And by the way you have made lots of really cute stuff! I'm about a year late, but I just found your blog and am catching up. So glad J made it home safe and sound. Good work, Mama. You did it. I just found your blog while searching for info on how to make drawstring bags. I am disabled by a back injury that Uncle Sugar doesn't see as debilitating. Fortunately I have the best wife who has been right there with me for the past 10 years. Well, recently she resigned from her job as an RN because she was disgusted with the tack the medical care industry has taken in the 20+ years she has been a nurse. So I thought I might try to make some money selling home made crafts on the net. This brought me to your blog where I have been reading trying to catch up on your saga. YAY!!!!!!! I'm so incredibly happy for all of you. J., I'm so glad you're home, so very, very thankful for all you have done for us. Have a wonderful holiday together you guys!! I am so happy for you, E. and J. I know this was not easy but you did a great job keeping it all together. Please keep on blogging. I love reading the updates. Welcome Home J.! I love the pictures. 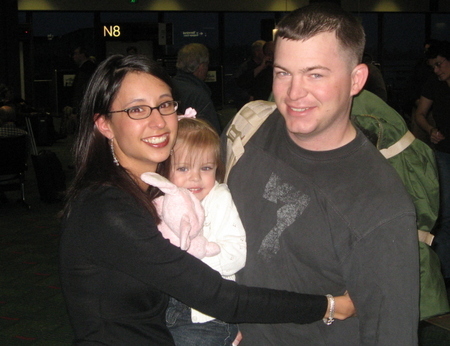 Your writing has helped me tons during the deployment and for that I thank you. 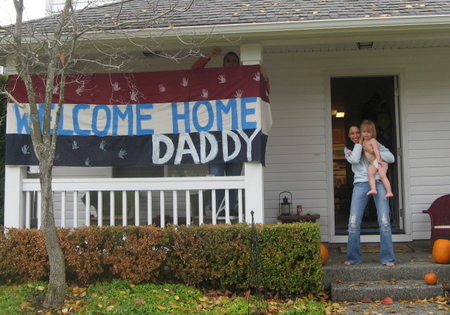 Congratulations -Welcome Home and enjot the Homecoming. I am glad you will continue to provide updates about your beautiful family and your creative crafting. 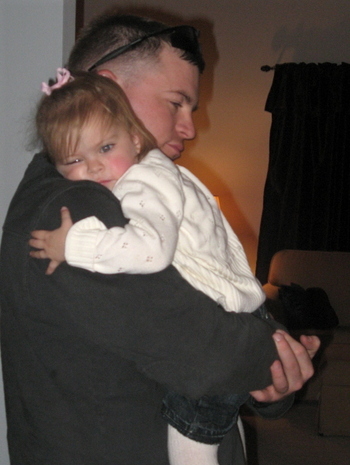 I'm so happy and excited that the deployment is over and J. is home again with you and your precious daughter. I look forward to reading more about your "adventure" in getting out of the Army and moving on with your lives. Thank you again for the sacrifices you have all made for our country. It's really lovely to see you reunited, knowing James is safe. I, too, got teary eyed after reading your post that James was finally home. YAY!! What a wonderful day for yall. I got tears from checking out these pics! Congratulations for having your hubby home. I can't even imagine how happy you are. What a wonderful day! (stalker from CinC!) I'm so glad to see and hear that he's back safe and at home. It brought tears to my eyes to see the pictures. Thank you for having this blog to help others that may be in or going to be in the same situation. I think I may use my own deployment anxiety on just the same thing...crafting!!!! i am SO happy for you and E! *sniff ---- teared up a bit. PS - When my husband got our of the CG, he used a headhunter who specialized in finding jobs for Military men/women. I'd be happy to share the name of the firm, etc if you're interested (This was about 5 years ago) He went to career conference, etc. He said some of the mock interviewing etc that they gave him was really helpful. Whew! I am breathing easier now. Glad he is home..and you all can begin again..
One of the silent stalker here :) From Finland ;) i have been reading your blog for a long time. Enjoy hes homecoming and keep us posted :) I wish all the best for you.